Mexico, one of Latin America’s big economic power houses, held presidential elections on 1 July 2018. The newly elected president, Andrés Manuel López Obrador, was elected with 53% of the national vote for his left-wing progressive agenda, defeating the party of the outgoing president, Mr Peña Nieto. López Obrador promised the country’s indigenous peoples significant change, including recognition of land rights. Only time will tell whether his promises will turn reality. In terms of total numbers of gross domestic product (GDP) at purchasing power parity (PPP), Mexico ranks second in Latin America and Caribbean countries after Brazil and 11th in the world, which is why it has been referred to by experts as ‘Latin America’s rising star’. However, already in respect to GDP (PPP) per capita the country does not perform as well and ranks ninth in the same geographical area. When looking at the number of Mexico’s Gini coefficient, an index measuring the distribution of wealth within a country, this performance deteriorates further. Mexico’s Gini coefficient amounts to 48.2, with 0 representing perfect equality, while an index of 100 implies perfect inequality. This renders the country the 25th most unequal country in the world. This unequal distribution of wealth is not coincidental, but rather correlates strongly with the social stratification of the country’s population along lines of ethnicity and color. The poorest Mexican states, generally located in the southern parts of the country, such as Oaxaca, Chiapas, Puebla, Guerrero and Tlaxcala, coincide with the areas mainly inhabited by the country’s indigenous peoples, with percentages of 65.73, 36.15, 35.28, 33.92 and 25.24 respectively. When contemplating the country’s political history, the victory of presidential candidate Andrés Manuel López Obrador (AMLO) in these presidential elections could well mean a historical breakthrough and the announcement of a new era in the Mexican political landscape. The country today is a presidential republic, with elections held every six years. Outgoing President Enrique Peña Nieto won in 2012 and has been the head of state since. His party, the Institutional Revolutionary Party (PRI), has ruled the country for 72 consecutive years, from after the Mexican revolution until the early 2000s. The PRI’s rule was only suspended recently in 2006 with the electoral victory of Felipe Calderón from the Party of the Democratic Revolution (PRD). It is this latter that AMLO was a member of until recently, when he founded a new left-wing populist party, the Movimiento Regeneración Nacional (MORENA). “The best foreign policy is good domestic policy.” This statement was one of AMLO’s principal slogans during his presidential campaign and already hints his agenda’s focus on Mexico’s internal problems and issues. In his roughly eight minutes long victory speech on the night of 1 July , the president-elect talked about broad topics such as the respect of human rights, the aim of banishing corruption and impunity for once and all, strengthening Mexico’s internal market and the country as an attractive business location. Unfortunately, AMLO did not mention the indigenous communities, raising questions whether the victory of the new party will actually change the course of Mexican politics towards them. After decades of exploitation and grabbing of their remaining ancestral lands, indigenous groups want to see a change to Mexico’s current neoliberal order. For too long they have suffered from poverty, poor education, malnutrition, environmental damage, migration, insecurity and violence. 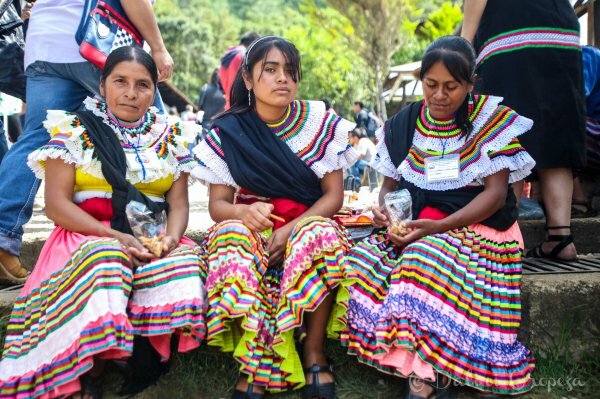 Historically, Mexico’s indigenous population has been well-organised in the form of political movements, active in pressuring the elite and demanding respect for their rights. Two major examples of such organisational structures are the Chicano Movement, dating back to the 1960s. This civil rights movement was not an indigenous rights movement per se, but many demands of the working class, including the restoration of land grants and farm workers' rights, coincided with those of indigenous communities. A second important political group, the Zapatistas, emerged in 1994 in the Mexican state Chiapas. The members of this left-wing revolutionary political movement are mostly rural indigenous people seeking control over their ancestral lands and the use of the resources located within these. In spite of this important momentum in the history of rights for Mexico’s indigenous people, many communities are still deprived of their basic rights and suffer from poverty caused by governmental land-grabbing policies, unable to work their own fields and consequently be self-sufficient or make an income by selling their harvest. Therefore, the electoral promise that has attracted most attention among indigenous communities and above all the ‘campesinos’, is AMLO’s objective to pursue Mexico’s agricultural self-sufficiency. Thus, by many indigenous groups leaders’ AMLO’s candidacy is considered as an opportunity to improve their communities’ lives by regaining land rights, thereby also increasing productivity and leading to economic growth. Leaders of about one-hundred indigenous organisations have stood up publicly and encouraged their communities to vote for AMLO on 1 July 2018. During his electoral campaign, the incoming President has affirmed that a new stage of saving the indigenous lands would commence under his administration. It remains to be seen how these objectives will be achieved without increasing the cost of living for Mexicans due to a less competitive domestic market. A more concrete agreement concerning the rights of the indigenous peoples was signed in April 2018 in Jerez, Zacatecas between representatives of the National Indigenous Movement, ‘Movimiento Indígena Nacional’, and AMLO. This plan’s exact designation, ‘Plan de Ayala Siglo XXI’, is a reference to the former times established ‘Plan de Ayala’ written by the revolutionary leader of the Zapatista movement Emiliano Zapata in 1914, during the Mexican Revolution. This new Plan de Ayala for the 21st century, signed by the President, includes thirteen points touching upon a number of issues such as the recognition of land ownership and the prevention of its privatisation by the government, the fight against hunger, the access to social services, such as schools and hospitals, in rural areas, the rights of day labourers in the fields, logistical support for indigenous agricultural production and the recognition of their natural resources as a common good instead of commercial products. Furthermore, the plan emphasises the rights of indigenous youth and indigenous women. The former ask for more employment opportunities in order to have decent prospects for their future, other than emigration or engagement in illegal activities. The latter ask for empowerment, not only in terms of equal rights as citizens, but also as producers of agricultural products. With respect to economic development, the ‘campesinos’ find themselves in the compromising situation of a market flooded with expensive foreign goods of poor quality. At the same time, they suffer from not being competitive enough, which is why in the Plan de Ayala they ask the Mexican government to support their small to middle size productions in order to regain agrarian independence. Mexico, a country with 62 officially recognised indigenous peoples, 282 indigenous living languages and a history going as far back as the civilisations of the Aztec, the Maya and the Olmec, has elected a President who made numerous promises to these indigenous populations, including to finally secure their ancestral and cultural rights. While bold promises made during campaigning time are welcome, their implementation is a different kettle of fish. AMLO is going to formally assume office by the end of this year  because of Mexico’s unusually long presidential transition period of five months. Only after that period will it be possible to say whether he intends to comply with the promises he made to the country’s indigenous populations or whether this left-wing shift is just another expression of populism in Latin America.